As the sun went into total eclipse on July 29, 1030 (July 30, according to modern astronomers), King Olaf’s army was defeated and he himself was killed, as had been revealed to him in a vision just before the battle. But immediately a great fear fell on the soldiers of Canute’s army. And then miracles began to be manifested at St. Olaf’s body: a light was seen over it at night; a blind man recovered his sight on pressing his fingers, dipped in the saint’s blood, to his eyes; springs of water with healing properties flowed from his grave; and then, to the chagrin of Canute’s first wife, Aelgifu, and her son King Swein of Denmark, his body was found to be incorrupt. 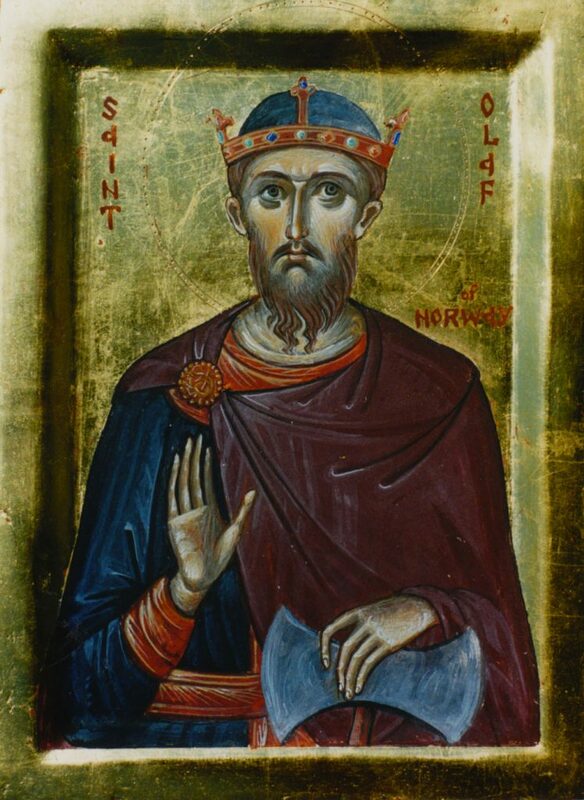 Soon the penitent Norwegians expelled the Danes, and recalled Olaf’s son Magnus from Russia to be their king. The incorruption of Olaf’s body was certified by his loyal Bishop Grimkel, whose see was Nidaros (Trondheim). As we read in St. Olaf’s Saga: “Bishop Grimkel went to meet Einar Tambarskelver, who greeted the bishop gladly. They afterwards talked about many things and especially about the great events which had taken place in the land. They were agreed among themselves on all matters. The bishop then went into the market and the whole crowd greeted him. He asked carefully about the miracles which were related of King Olaf and learned a great deal from this questioning. Then the bishop sent word to Torgils and his son Grim at Stiklastad, calling them to meet him in the town. Torgils and his son did not delay their journey, and they went to meet the bishop in the town. Then they told him all the remarkable things which they knew and also the place where they had hidden the king’s body. The bishop then sent word to Einar Tambarskelver, and Einar came to the town. Einar and the bishop then had a talk with the king and Aelgifu and asked the king to allow them to take up King Olaf’s body from the earth. The king gave permission, and told the bishop to do it as he wished. Then a great crowd assembled in the town. The bishop and Einar then went with some men to the place where the king’s body was buried and had it dug up. The coffin had by this time almost risen out of the earth. In accordance with the advice of many, the bishop had the king buried in the ground beside St. Clement’s church. It was twelve months and five days from the death of the king to the day his holy relics were taken up, the coffin having risen out of the earth and looking as new as if it had just been planed. Bishop Grimkel then went to the opened coffin of King Olaf, from which there proceeded a precious fragrance. The bishop then uncovered the king’s face, and it was completely unchanged: the cheeks were red as if he had just fallen asleep. Those who had seen King Olaf when he fell noticed a great difference in that his hair and nails had grown almost as much as they would have done if he had been alive in this world all the time since his fall. King Swein and all the chiefs who were there then went to see King Olaf’s body.